Aside from being a life survival skill, the importance of swimming can be felt — and enjoyed — in its countless health benefits. According to the Centers for Disease Control and Prevention, just two and a half hours per week of this exercise can help ward off and reduce illnesses. 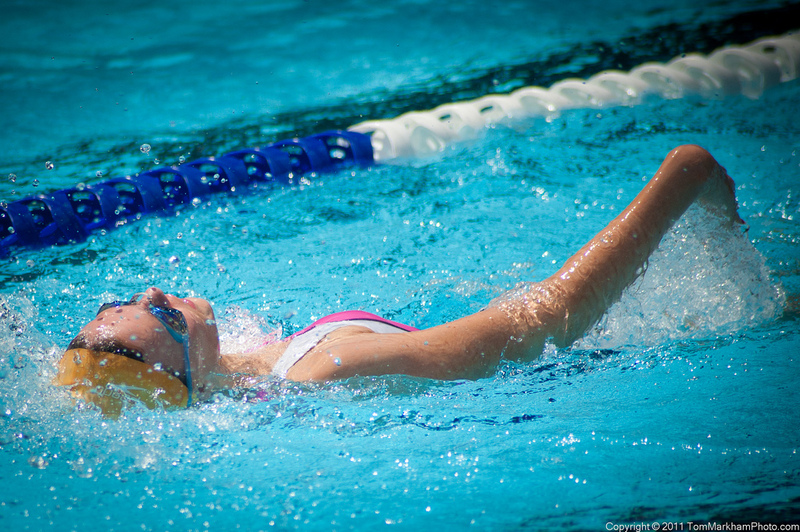 Swimming is also easier on the body compared to exercising on land as it does not put as much pressure on the joints. Also, it is proven to improve one’s mental health. With the summer heat fast approaching, swimming is one of the coolest things you can do this weekend especially if you live in a condo in the Philippines. If you are just starting out, the condo swimming pool is perfect for learning to swim at home. One, it is conveniently within your reach so you can consistently practice. Two, the swimming pool in your condo is a safe place for beginners who are advised to avoid the unpredictable currents in moving water. Make the most out of this condo amenity and incorporate swimming into your fitness game plan. Take the plunge with this beginner’s guide to swimming. For newbies, invest in basic swimming equipment. 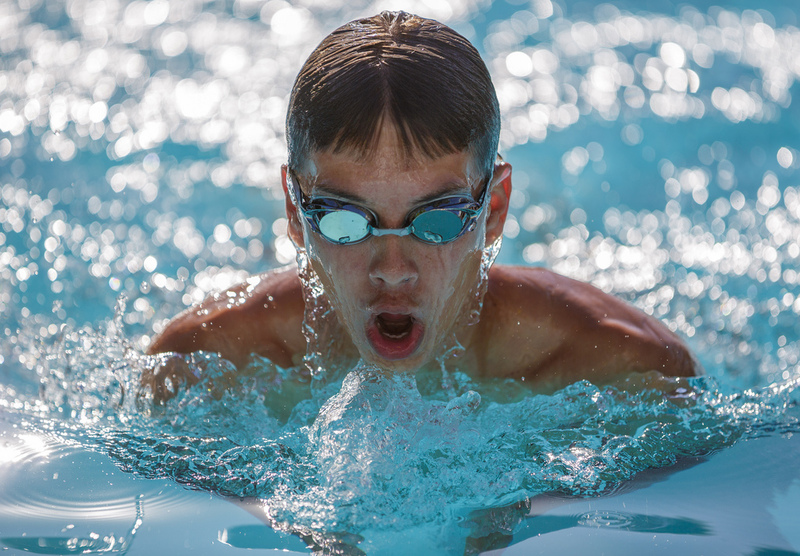 Goggles help you see better underwater by keeping the pool chemicals and any debris away from your eyes thus, it should be a comfortable fit that’s not too tight or too loose. Keep your hair away from your face with a swim cap. Buy a kickboard, but not floatation devices that go around the arms or the waist as these do not help. Have other essentials handy like sunscreen, towel, and drinking water. Yes, it may be swimming, but it is still an exercise and you will need to hydrate. Even if you figured out that you go for self-taught swimming lessons, you still need someone to look after your safety. If you don’t have a lifeguard, bring a friend along, preferably someone who is a good swimmer. Let go of whatever fear or reservation that you have with the water. It may not be easy, but it is totally possible with enough time. Starting from the shallow end, dip your feet, feel the water, and slowly walk until the water reaches your shoulders. Stay within a safe depth where you can stand up near the side of the pool so you have something to hold onto. Facing and holding on to the side of the pool, let your legs float out behind you. Gradually, hold the kickboard in front of you with straight arms, push yourself off from the wall, and relax your entire body so you float on your stomach. Then, try floating on your back. Take a deep breath, slowly lift your feet up while leaning backward, and spread out your arms. Practice learning how to float until you can do this for at least 15 to 30 seconds. Do not panic. Just let the water bring you up. Think: if something as heavy as a boat can float in the ocean, how much more you in a swimming pool? Thanks to buoyancy, floating is possible as long you keep calm. Two things that beginners need to do are to be comfortable with their face in the water and to find the breathing rhythm. Take your time with learning how to breathe properly. While standing, inhale through the mouth and slowly exhale through the nose. Repeat consecutively until you are comfortable. Now, hold on to the side of the pool, bend forward, and place your face in the water. Do the same breathing routine, but try it with your head turned first to one side and then the other. Also, keep the top of your head down. Repeat until you get a comfortable grasp of this. Then, let go of your hold, float on your stomach, and repeat the routine. Kick your legs outwards while holding on to the side of the pool and while floating. Try the flutter kick by making small, alternate kicks with your toes pointed outwards and your legs straight. 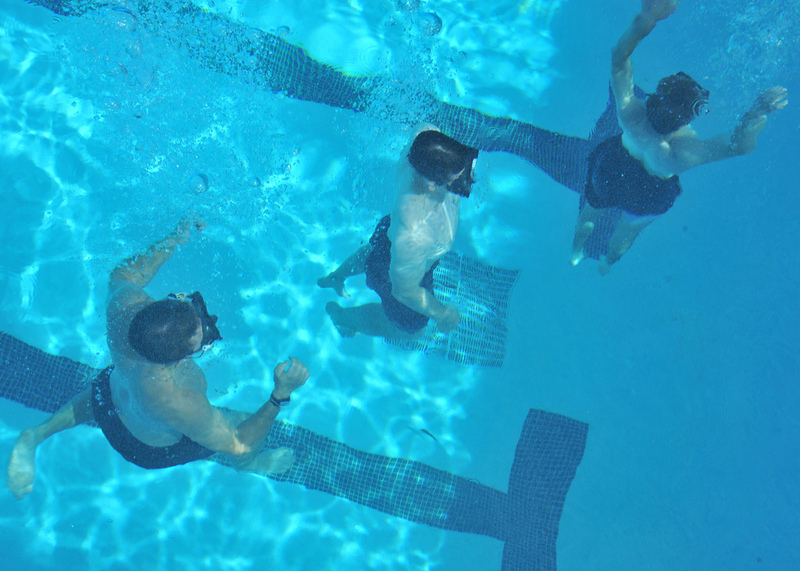 A reminder, kicking can be quite challenging for beginners as you will have to exert more pressure underwater. To check your kicking progress, do it using only a kickboard. 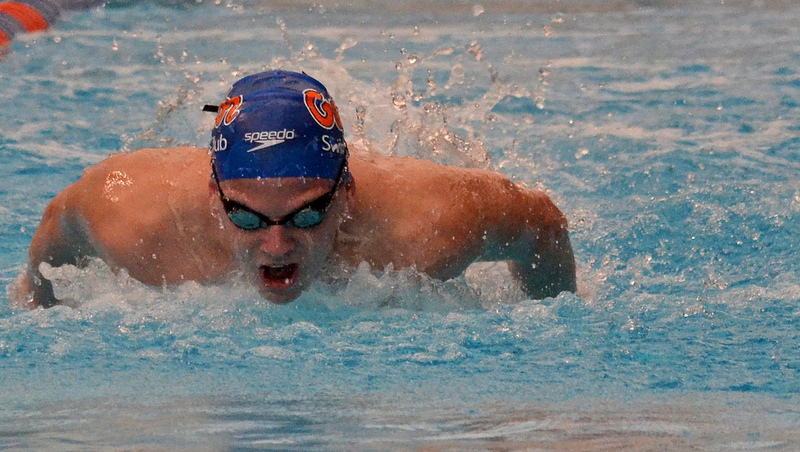 Strokes are what will move you quickly in the water. First, try a back stroke. As you float on your back, flutter kick with your legs. Hold up one arm into the air. Keeping your arm straight, your palm flat, and your fingers together, bring your arm down backwards into the water near your head. As it hits the water, relax your arm a bit so it can prepare for the next stroke after the other arm. Alternate your arms. Now, a front stroke. Float on your stomach and do a flutter kick. Hold up one arm stretched forward in the air. Bring it down underwater and cupping your hand, wade your arm through, as if you were pushing the water behind you. Alternate arms. Treading water means staying afloat standing up by moving your legs. First, you do the sculling water move by extending your arms sideways and keeping it level with your shoulders and on the water surface. Do an alternating forward and backward sweeping with your arms. Use your hands with your fingers together to push the water. As you scull the water with your arms, do the flutter kick, varying the speed to know what best keeps you afloat. 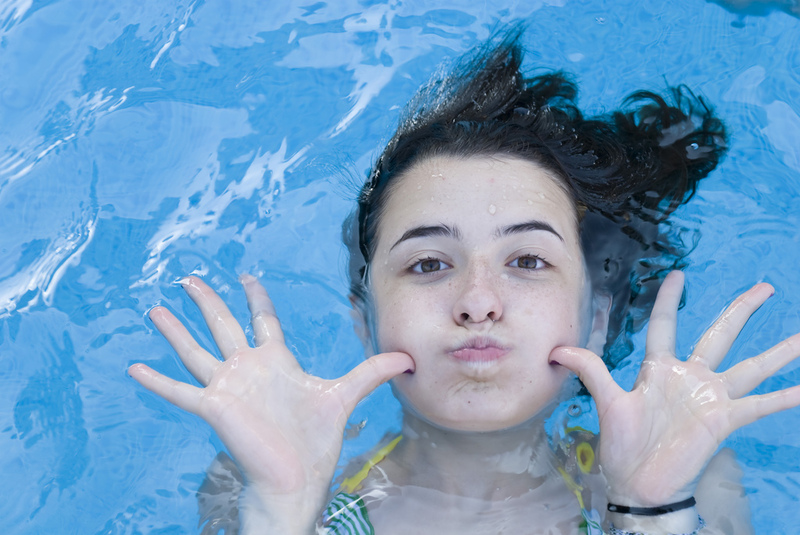 To reach the surface of the water from below, straighten out your arms above your head, with your palms facing outwards. Push yourself up by quickly bringing them down. Repeat as needed. The key here as with any other sport is keeping on trying until you see progress. It is a good thing swimming is one of the exercise and fitness activities that you can do in your condo. You just need to block off 1 to 3 hours from your weekly schedule so you can focus on learning this new skill. Once you have mastered the basics, you can move on to the advanced level if you want. It’d be amazing to go from having butterflies in your stomach as you try not to panic to actually pulling off butterfly strokes. Swimming is a relaxing, healthy, and practical way to spend your time. Thanks to the swimming pool, learning to swim in your own condo makes it all the more convenient especially for first-timers who make the most out of condo living.